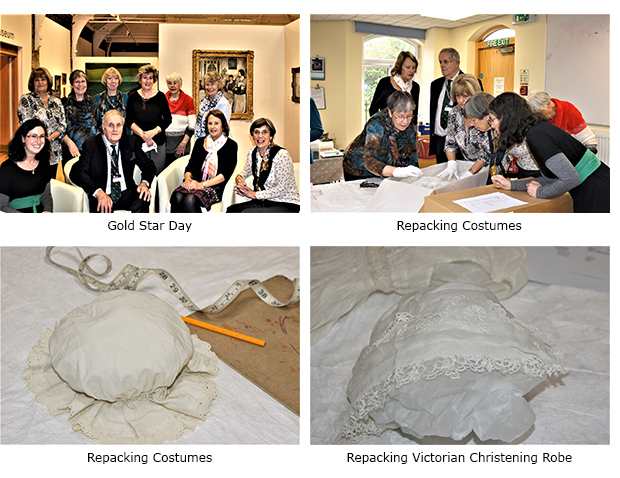 The Arts Society Heritage Volunteers have been working at the Museum since 2004, and, of the six original volunteers, two are still regular members. In recognition of their dedication and commitment, the Area Heritage Volunteer Representative, David Brass, awarded the Group a Gold Star Certificate, following on from their West Midlands Museum Volunteer Award, which they won last year. David presented the award to the Group in October, when the Chairman, Elizabeth Hunter, was also present. Over the years the Group has carried out numerous tasks. These have included work on the textile, ethnographic and social history collections and more recently, mounting the samplers. 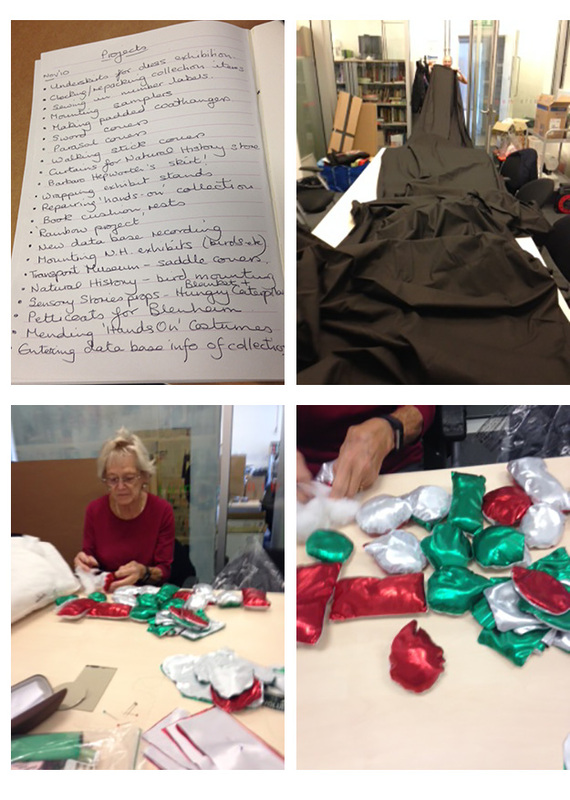 They are now revisiting a task they first began in 2004, which is the checking and repacking of the costumes in the Textile Collection. After two years and 830 hours of volunteering, the Volunteers at All Saints’ Church, Leamington Spa, have finally completed the repair work to the Church’s wonderful collection of ecclesiastical embroidery, ranging in size from small collection purses to large altar frontals. As a result of their work, the Group has won a Golden Jubilee Award (formerly the Gold Star award), "In recognition and appreciation of their outstanding contribution to Volunteering for the Arts Society". 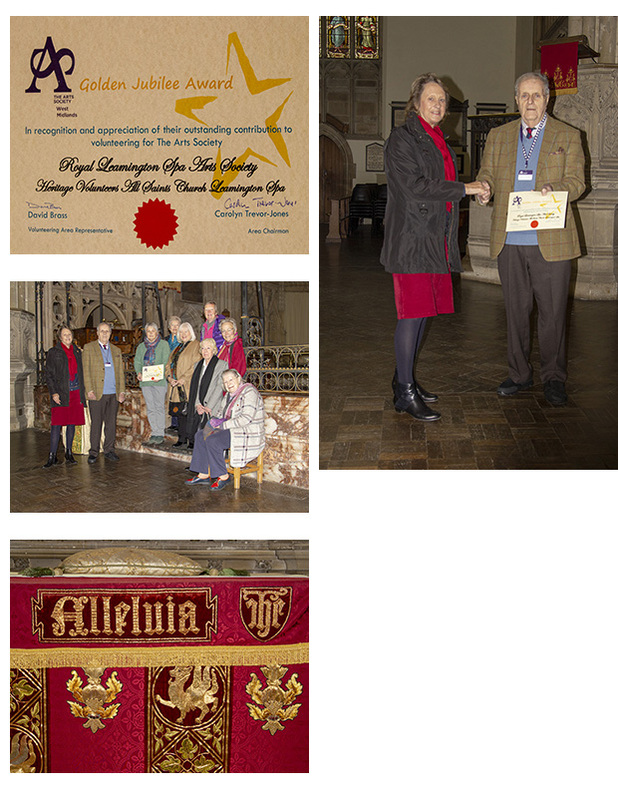 David Brass, the Area Heritage Volunteer Co-ordinator, presented the award to the volunteers at the church in November. He was then shown examples of the work they had carried out, ranging from large altar frontals to small collection purses. As a permanent exhibition of the work of the Volunteers, three examples of their work will shortly be displayed in conservation display cases in the church, and a banner, with photographs of the volunteers at work, is also displayed in the church. In November 2018, the volunteers at the Herbert Museum in Coventry will celebrate EIGHT YEARS of volunteering at the Museum. In August the Group was nominated for the West Midlands Volunteer Awards, Collections Section, and reached the finals. Sadly, they did not win, being beaten by Compton Verney’s Forest School Volunteers. However, they had a wonderful evening at the award ceremony and enjoyed “being made to feel very special”, which, of course, they are! During their years at the museum, the Volunteers, Ruth Barton, Anne Haywood, Alex Harris and Shirley Jack, have been involved with a huge variety of projects, ranging from making underskirts for a dress exhibition at Blenheim Palace, mounting samplers, making padded coat hangers, sword covers, parasol covers and even mounting birds for the Natural History section of the museum. One of their more unusual projects was making saddle covers for the bicycles in the Transport Museum. They have also made Sensory Story props for the younger visitors to the museum, including The Hungry Caterpillar and a sensory blanket. More recently, they have been very busy making backdrop curtains for the Santa Sleigh ride at the Transport Museum, a ride which has been popular in Coventry for over thirty years and used to be owned by The Co-op. It is like a simulator – the sleigh goes up and down and the backdrop , which is painted with a scene, moves giving the impression you are flying! The original backdrop was falling to pieces and a new one was needed, which is like curtains with heading tape. This sounds quite straightforward except that each of the 2 curtains was 12 metres long. Trying to cope with all that material going through a machine was challenging, but, as usual, the group found some innovative ways of handling the situation – as can be seen in the photos. The Transport Museum were so grateful for this work that they very kindly bought the group a new sewing machine … and … promised them a ride in the sleigh when it is up and running!